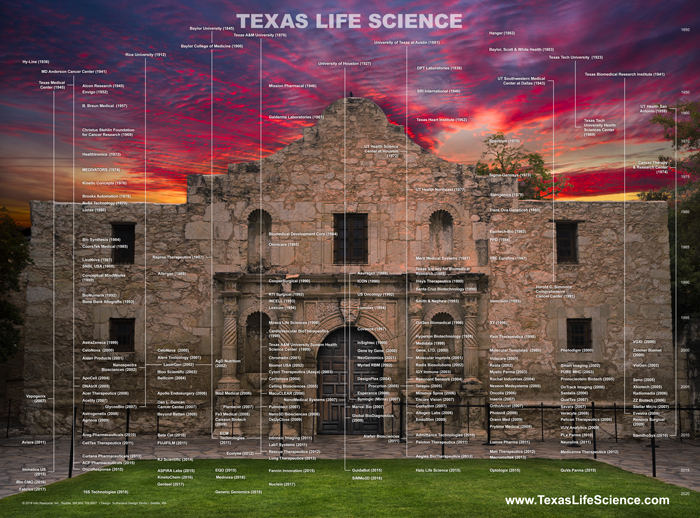 We invite you to explore Texas Life Science Genealogy, a one-of-a-kind image that illustrates the founding technology origins of more than 220 life science firms located in Texas. Specifically, the origins of the companies' founding technology with the state's universities and non-profit research organizations -- longstanding centers of innovation, technology transfer and job creation. Please note this is a draft document, and we encourage all life science companies, universities and non-profit research organizations located in Texas to review their individual listing on the Texas Life Science poster, and to forward corrections, additions, or other changes to: Suggestions@InfoResource.org. We hope our Life Science Genealogy posters are informative, and helpful to life science leaders, and others in communicating with their Legislature, local government officials, educators and the public about the industry and its human and economic impact on healthcare, agriculture, and the environment. Texas Life Science Genealogy 2018 © Info.Resource, Inc.